By Christopher D. Sanders, M.D. A 71-year-old woman with Clostridium difficile colitis was anticoagulated for deep vein thrombosis. When she developed right lower abdominal pain, it was initially believed to be due to her colitis. Because of worsening pain, along with tachycardia and hypotension, noncontrast (A) and contrast-enhanced (B) CT imaging was performed, demonstrating a large right-sided rectus sheath hematoma (RSH) (A) with active extravasation resulting in a fluid-fluid level (B). A digital subtraction angiogram showed active extravasation from the right inferior epigastric artery (arrow, C), with subsequent successful gelfoam and coil embolization (D). Salemis NS, Gourgiotis S, Karalis G. Diagnostic evaluation and management of patients with rectus sheath hematoma. A retrospective study. Inter J Surg 2010;8:290-293. Rimola J, Perendreu J, Falco J, et al. Percutaneous arterial embolization in the management of rectus sheath hematoma. Am J Roentgenol 2007;188:W497-502. Sanders CD. 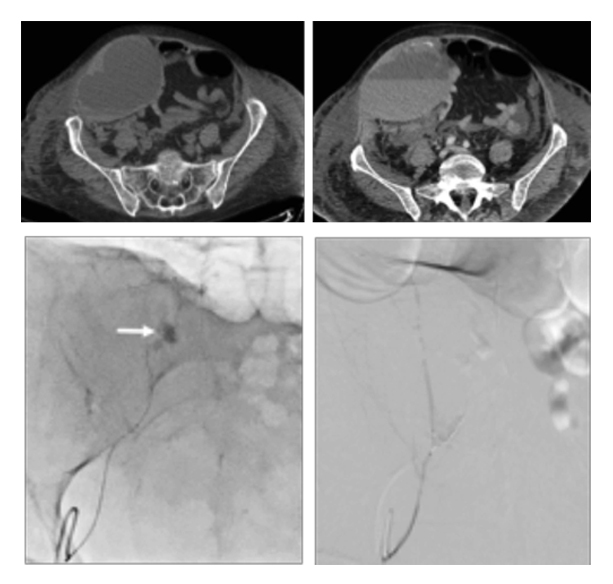 JAOCR at the Viewbox: Rectus Sheath Hematoma from Inferior Epigastric Artery Bleed. J Am Osteopath Coll Radiol. 2018;7(2):20. Dr. Sanders is with the Department of Radiology, David Grant USAF Medical Center, Travis AFB, CA.